Those that enjoy playing online slots are in for a treat as Slots Million casino has just gone live and it is trying to offer players the biggest selection of online slots possible. In order to achieve this the site offers games from numerous developers including Cryptologic, GamesOS, Genesis Gaming, iSoftBet, Leander Games, Microgaming, Net Entertainment, NextGen Gaming, Playtech, Rival Gaming and Saucify . In total there are over 1100 slots to enjoy ranging from the most basic of classic slots to the latest video and 3D slots. Furthermore, many of them are linked to large progressive jackpots. 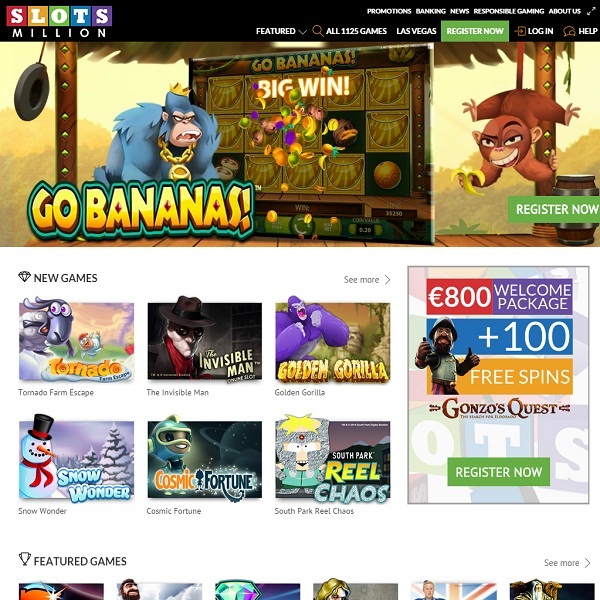 Slots Million is greeting new players with 100 free spins and an €800 Welcome Package. Furthermore, there are regular opportunities to receive more free spins, reload bonuses, loyalty rewards and the chance to take part in special competitions.